Quirt and Brody have a fan site at Facebook! Suki, Quirt and Brody don’t get to take their horses on this trip, but still manage to get into plenty of trouble. This time they have an adventure of the supernatural kind with Josie Taboo and her ghost hunters. Even the additional, armed ranch hands and the new security system weren’t enough to protect his family and Mark became more determined to put an end to Rotter’s attacks. While the rest of the family was gone to San Francisco, Mark Farnsworth and Donna Evans, Brody’s mother and Sheriff’s deputy, stayed in Arizona to track down Otto Rotter. But unfortunately, Otto Rotter was already a step ahead of them. He already had new plans to ruin Mary’s career and destroy her family. Rotter was no longer in Arizona. He heard about Mary’s trip when he had one of his thugs hacked her email. He set out for San Francisco to get there before she did, planning to use a demon spell that he put into action weeks before. The family members and friends find themselves in the kind of bad trouble that could destroy the strongest of friendships and even bring an end to their lives. 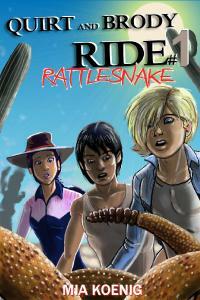 To celebrate Suki’s fifteenth birthday, Quirt plans a trail ride and cookout, but their outing is cut short by an encounter with a rattlesnake. With no adults around to help, they have to cope on their own. Suki has an unusually severe, strange reaction to the snake venom, and they find out it was a very unusual variety rattlesnake. After a couple of weeks of recovery, Suki is still upset by all that has happened in her recent past. She gets mad at Quirt and runs off during a desert thunderstorm. 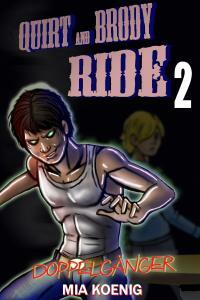 The boys find her, but all three are unexpectedly captured and tortured by a mad scientist. This is the first in a series of stories about Suki, Quirt and Brody.